Back to 2016 Scenic Definitives. Forward to 2018 Scenic Definitives. 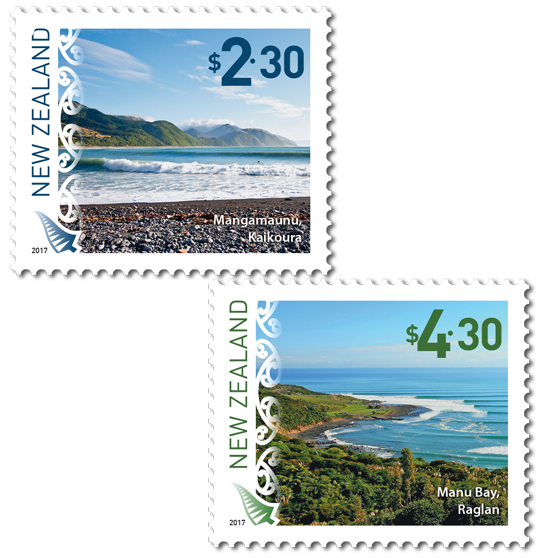 While New Zealand Post has worked hard to keep postage rates as low as possible, an annual decline in mail volumes has resulted in a review of the costs of our products and services. From 1 July 2017 FastPost will increase from $1.80 to $2.30 for a medium letter, from $2.80 to $3.30 for large letters and from $3.80 to $4.30 for oversize letters. 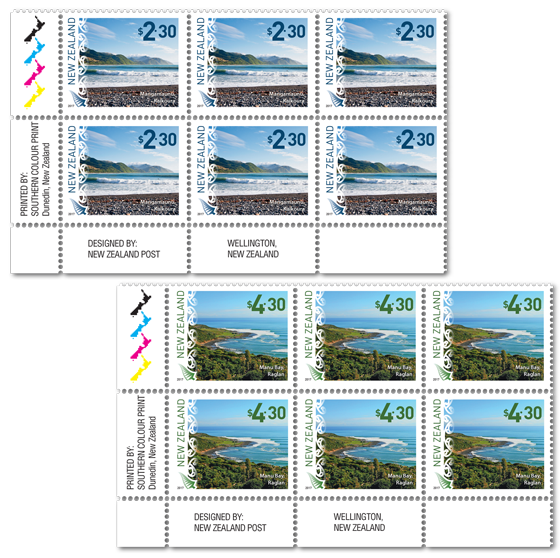 To meet these changes, New Zealand Post is issuing two new scenic definitive stamps for the $2.30 and $4.30 denominations. 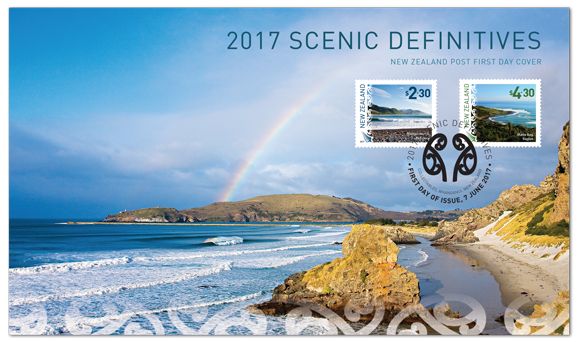 There is already an existing scenic definitive stamp for $3.30 which features the iconic Dunedin railway station. Our isolated, water-bound country boasts 14,000 kilometres of unmatchable coastline. From long sandy beaches to steep rocky inclines, New Zealand’s beaches come in all forms, and almost all of them are capable of producing a surfable swell. 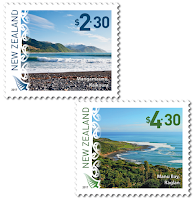 Following on the theme of the surf-break issue, these two definitive stamps also feature popular surfing locations. 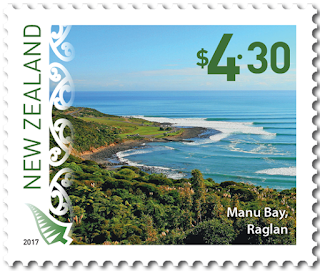 See also 2017 New Zealand Surf Breaks. It was feared that the 2016 Kaikoura earthquakes may have damaged this prime right-hand break, but waves still peel down the point for over 300 metres. And new breaks have since appeared along the coast. $4.30 - Manu Bay, Raglan. Brought to international attention in the 1966 movie ‘Endless Summer’. This surf break is well known for its accessible and consistent left-hand tube. First-day cover - 7th June 2017. Even more of New Zealand’s coastline is captured with this stunning first-day cover. 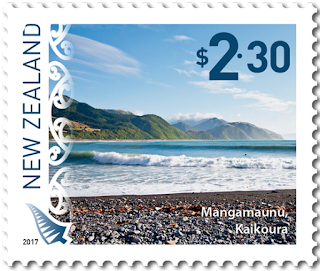 Both stamps are available on this first-day cover which features a scenic shot of Dunedin’s Aramoana Spit. A popular, if somewhat nippy, surf break in the South Island. Notice the interesting special cancel for this issue which shows the unfolding fronds of a New Zealand fern. Plate Blocks with 6 stamps. Unless stocks are exhausted earlier, these stamps will remain on sale until further notice. The first-day cover will remain on sale until 6 August 2017.